A land of evocative and haunting beauty; thick green forests, mist-shrouded mountaintops and rustic country dwellings nestled amongst paddy fields, combines with a land of the ultramodern; Of bustling metropolises, neon-lit streets shadowed by towering skyscrapers, and high speed rail and transport networks racing millions of commuters to work each day. South Korea has it all, an environment and setting to suit all comers, and the experience will be something utterly unique and compelling for anyone fortunate enough to visit the country. But the real beauty of Korea is its inhabitants. The people of South Korea are wonderfully gracious and amiable, and with a character as intriguing and delightful as the food you will be served. They are markedly eager to please foreigners, and visitors often leave the country with heartwarming tales of the kindness of Korean strangers. In some ways it is a mystery how South Korea has remained such a secret to widespread tourism, but such a situation is changing. Korean culture (known as the ‘Korean wave’) has blossomed out of Asia and onto the world stage. Its burgeoning music and cinema industries are a reflection of a country coming of age, and of a modern generation of youngsters ready to represent Korea in the global arena. Aside from these more recent developments, what is perhaps even more remarkable is how Korea has managed to keep its culture and traditions intact, despite the onset of modernity. And how the strong background of close familial ties, deep-routed respect for one’s position within society and the importance of education have not been eroded by the transformation into a modern capitalist state. The massive number of traditional festivals, times for family gatherings and community events are all hallmarks of a Korean culture that has existed for close to two thousand years, and yet are still accessible to the modern visitor to Korea. It is said that South Korea is a land of contrasts, and no-where is that more evident than in the South-Eastern city of Ulsan. There, the modern, technological and industrial heartland of Korea is married with a charming and provincial countryside, accessible within minutes of leaving the city. Nearby is the ancient Silla capital of Gyeongju, described as the “Kyoto of Korea” and home to a town full of cherry blossom trees, traditional eateries, and the pagoda-roofed buildings which one often imagines when thinking of Asia. The city itself, the fastest growing in South Korea and also the richest, is a testament to modern architectural design and planning. A fast, convenient and cheap transport system lets you get around with ease, from the glitzy department stores of the city centre, to the bustling street markets of downtown, and a variety of other locations. The city’s large variety of restaurants and cafes cater to all tastes; from traditional Korean rice and fried pork eateries, to Japanese, Chinese and other Asian ‘fusion’ foods, to the wide variety of well known Western-influenced fast food outlets, or even the obligatory Americano from a Starbucks. Certainly, you need never be hungry or thirsty. 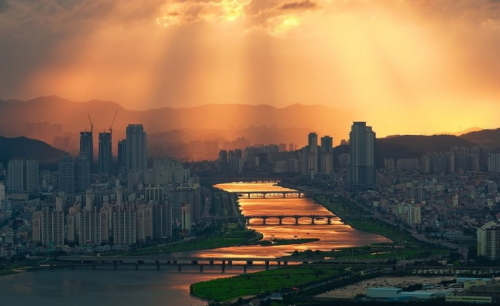 And with a working day which never seems to begin or end, it is all accessible at any time of the day or night; Ulsan is a 24hour a day city, a towering metropolis, the growing industrial heart of a country which continues to rapidly expand. The construction of a brand new high speed rail link (the KTX), an inter-city bus service, and domestic air travel which runs with a highly convenient frequency lets you access the rest of Korea both cheaply and with little hassle. Korea is not a large country, and there is no location (including the capital Seoul) which is more than a couple of hours travel away, meaning that you will have ample opportunity to explore the rest of the country during your time here. It’s location within the heart of Asia also means that International travel is straightforward. Indeed, many teachers working in Korea use their time there to explore other parts of Asia, and other interesting areas of the world not usually found on one’s doorstep.